—the general who became president! Ulysses Grant’s family was from the Ohio River Valley. Though reluctant to go to West Point, he attended and graduated in the middle of his class. In the Mexican War (1846-1848) he fought under and learned command from General Zachary Taylor (later 12th president of the United States) and Major General Winfield Scott, known as “Old Fuss and Feathers” and later was general of the Union Army. 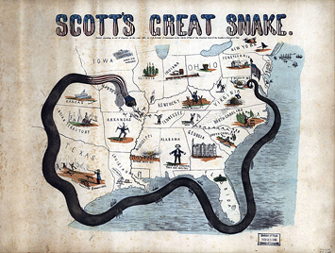 1861 Cartoon by J.B. Elliott of General Winfield Scott’s “Anaconda Plan” to "wrap around and crush" the Confederacy with a blockade. It resembled a snake that coiled around the South blocking delivery of supplies. Union Army leaders did not universally sanction this strategy, but as seen over the course of events throughout the civil war time frame, it was modified and unofficially endorsed. At the outbreak of the Civil War, Grant molded disorderly and wild volunteers into an effective regiment; subsequently he rose to the rank of brigadier general of volunteers. General Grant's first important victory was the taking of Fort Henry. He was then victorious at the Battle of Fort Donelson; and when the Confederates surrendered, President Lincoln promoted General Grant to major general. 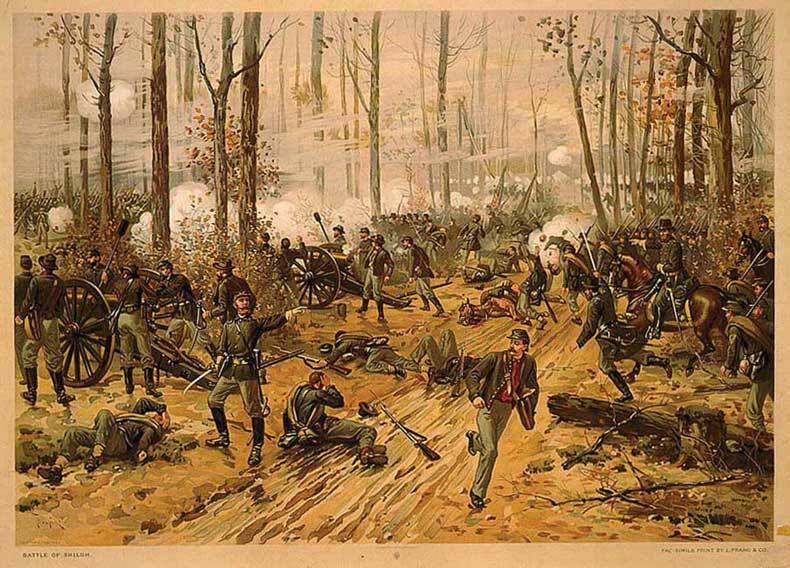 General Grant fought at the Battle of Shiloh, one of the bloodiest battles of the war. Later, he succeeded in taking Vicksburg. The Battle of Blacksburg was a brilliant military campaign that divided the Confederacy in two. 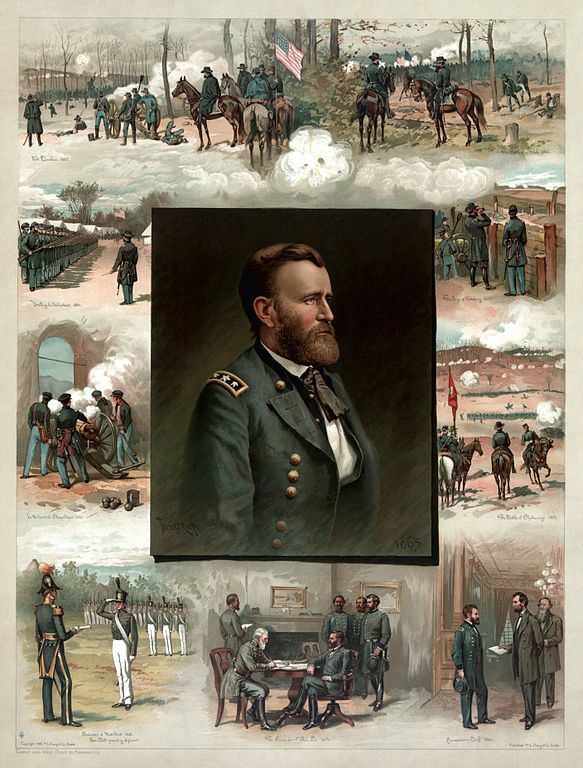 General Grant was ultimately appointed general-in-chief of the Union Army in 1864. His other effective campaigns were the Chattanooga Campaign, Overland Campaign, and Petersburg. General Grant pinned down General Robert E. Lee's Army of Northern Virginia at Appomattox Court House where Lee surrendered April 9, 1865. "When news of the surrender first reached our lines our men commenced firing a salute of a hundred guns in honor of the victory. I at once sent word, however, to have it stopped. The Confederates were now our prisoners, and we did not want to exult over their downfall." 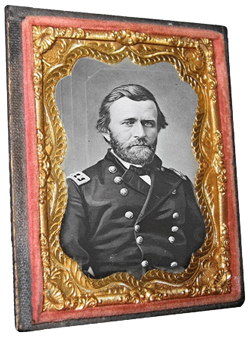 Ulysses S. Grant, April 9, 1865, Personal Memoirs of U. S. Grant (New York, 1885), pages 555-560. After the war General Grant went into politics and became the 18th president of the United States in 1869. Ulysses Grant died in 1885.